• 65% polyester, 35% cotton. 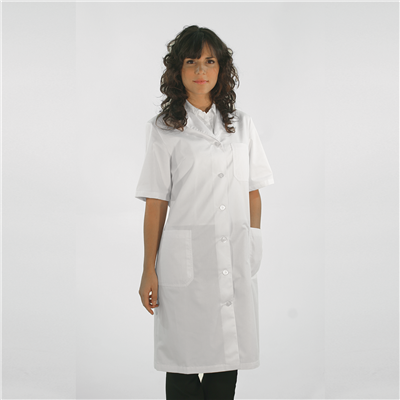 • The composition of these gowns makes them very resistant and at the same time easy to care during washing and ironing. Machine washable. - Open in the front, belt on back, one pocket in the chest and two lateral pockets, long sleeve model with button on the cuff. Green and white colour. - Open in the back with buttons, one pocket in the chest and two lateral pockets. Model of long sleeve with knitted cuffs. White colour. - Open in the front, fitted to the waist, one pocket in the chest and two lateral pockets. There are two models, one is long sleeve with button on the cuff, and the other is short sleeve. White colour. • Individual pack in shelf box + transport carton.